Hot springs are formed by the discharging of geothermal hot water at a specific geologic location. The mineral rich spring waters also have power to cure various diseases. So people used to bath in hot springs around the world for relaxation and treatment. Followings are list of best hot springs in the world. Jigokudani hot springs located in Joshinetsu Kogen national park in Nagano city of Japan. It is a part of Jigokudani monkey park. The Japanese word ‘Jigokudani’ meaning hell’s valley. It is called so because of the hot spring, thermal water coming out from frozen ground of the site surrounded by dense forest. Th park is much known for the large population of Japanese Macaques, The snow monkeys. 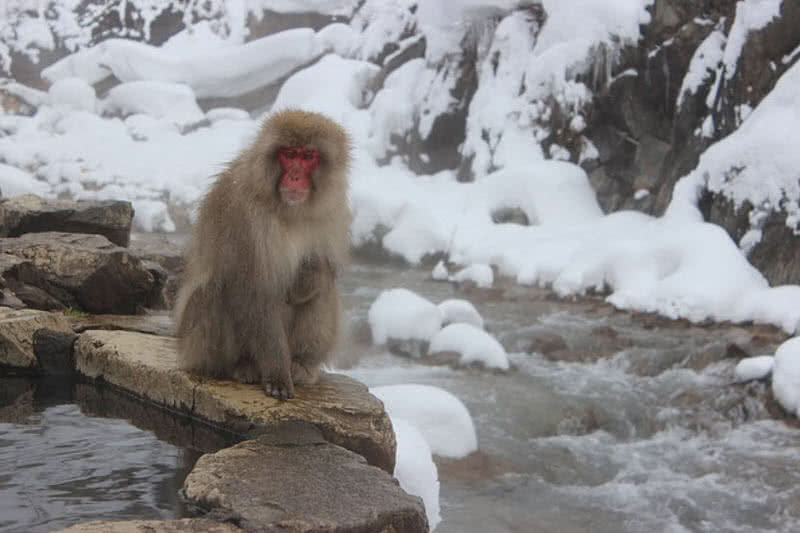 During winter season snow monkeys descend from the top cliffs of the park to enjoying in the hot springs in the valley. It is also become a rare chance for human to make a close observation on snow monkeys. Terme Di Saturina is a group of age-old hot springs located in Southern Tuscany in Italy. The geothermal formation was named after Roman God Saturn. 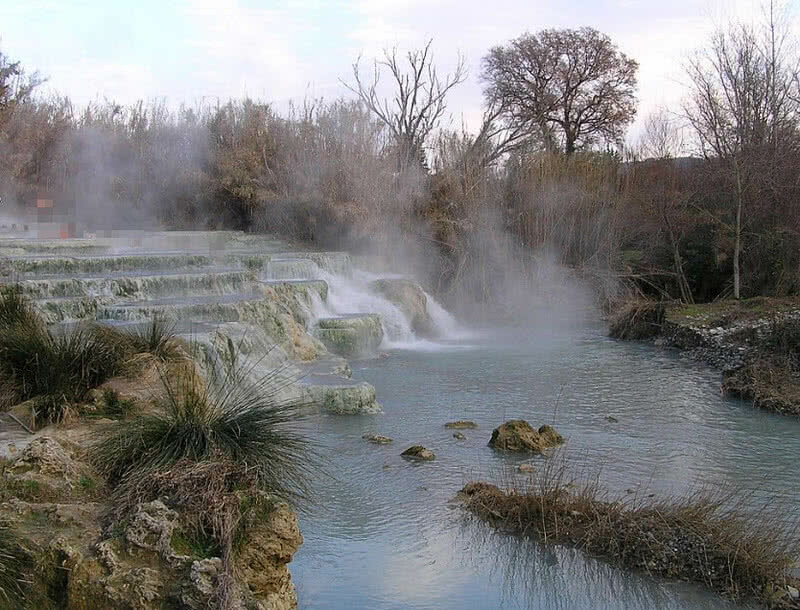 The minerals mixed spring waters of Terme Di Saturina offers relaxation and well being. Today the site is protected and managed by Terme Di Saturina spa resort. The minerals rich thermal waters of the resort help to boost respiration, reduce various skin problems and act as deep antiseptic cleaning agent. The decades long filtering through the bowels of Monte Amiata ( Lava domes in Southern Tuscany) makes exceptional quality for the waters of hot spring . The thermal waters coming out at the rate of 800 liters per second at constant temperature of 37.5 degree Celsius. Sulfur, carbon, bicarbonate alkaline, hydrogen sulfide and sulphate are the main dissolved minerals in the spring water of Terme Di Saturina. 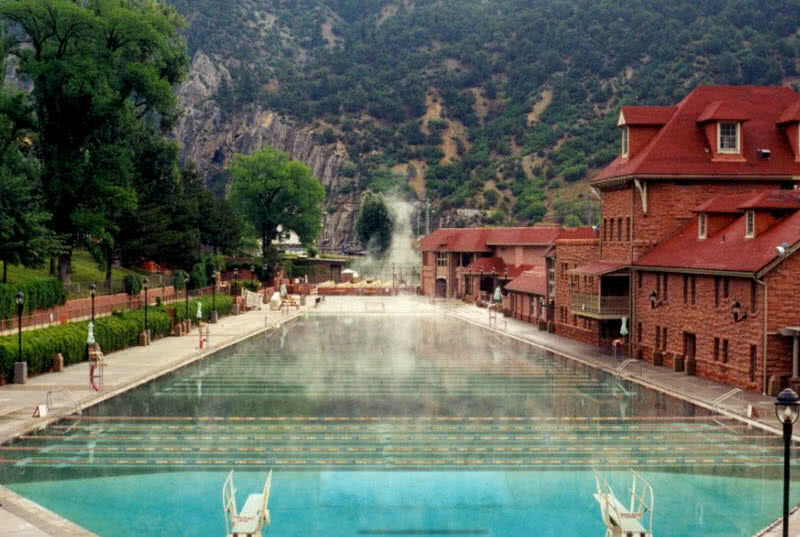 Glenwood hot springs is one of the popular hot springs of Colorado of United States. It is the largest hot springs pool in the world. The original spa and resort opened in the site in 1888 and it attracts thousands of visitors since that time. The pool is kept thermal water at constant temperature of 33.8 degree Celsius year around. There is also a small therapy pool at temperature between 38 degree Celsius and 40 degree Celsius. The Glenwood hot springs produce thermal waters at the rate of 8500 liters per minute. The mineral rich water also have power to heal many medical conditions. The Glendwood hot springs resorts the visitors will also get award-winning spa for good health. There is also 107 roomed lodge, massage centers and water slides. 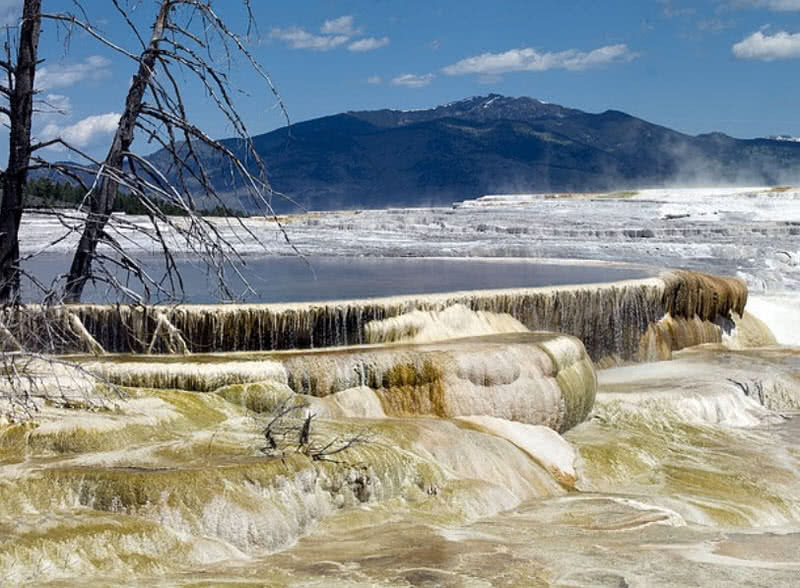 Mammoth hot springs is one of main geothermal highlights of Yellowstone National park in Wyoming of U.S. It was formed by thousands of years of volcanism. Unlike other thermal areas in Yellowstone the travertine formations (Limestone deposits) caused by the dissolution of limestone with arise of spring water. Rain and snow are the main water source of Mammoth hot springs. The underground water get warmed and arise to the surface by the action of magma chambers beneath the surface. Mammoth hot springs contain approximately 50 hot springs. Large volume of water coming out to the surface in every minutes. The terrace formation is the another notable features in the site. Such thick layers of sedimentary rocks caused by mineral deposits from the thermal waters of hot springs. It is the largest known depositing spring around the world. Blue lagoon thermal spa is the most popular attraction in Iceland. Every year the blue lagoon attract over half a million visitors. It is located in lava field in Grindavik town at South-Western coast of Iceland. It is actually a man-made lagoon. The spring water at the pool is the direct result of foundation of Svartsengi thermal powerplant. The pool was built in 1976 for filling water water from the geo-thermal power plant. After the discovery of healing power of geothermal water in the site Blue lagoon open the pool for public 1992. Blue lagoon holds six million liters of geo-thermal sea water. The temperature of mineral rich eater i the pool varies between 37 and 39 degree Celsius. Silica and Sulphur are the main dissoved minerals in the spring water of blue lagoon. The striking milky blue color of the water is caused by the presence of silicate minerals. The silica mud in blue lagoon have power to heal many skin problems. The geothermal water in the lagoon renevewd in every forty hours which ensures the purity of water. The blue lagoon company also offer in water massages, beauty treatments, spas and guided tours for the visitors. Pamukale is a group of hot springs and travertines located in Denizli province of Turkey. The natural site named after it’s cotton castle (Pamukule in Turkish) outlook. It is 2.7 kilometers in length and 600 meters in width. The unique castle shape and pools are formed by the deposition of minerals. Pamukale has been used as thermal spa since second century B.C, established by king of ancient Greek city Pergamon. The site is recognized by UNESCO as a world heritage site in 1988. 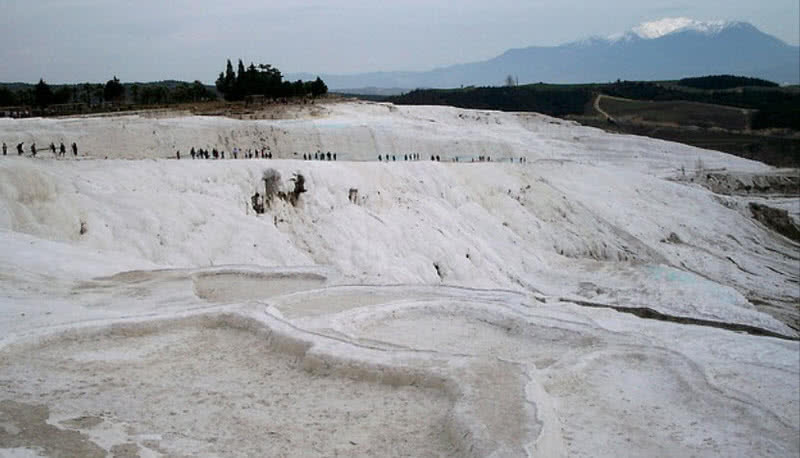 Pamukale contains seventeen hot springs in total. The temperature of spring water varies between 35 and 100 degree Celsius and containing calcium salts and carbon dioxide. Grayish-white limestone sediments formed continuously through the decomposition of spring water. The thermal water also get collected in the terraces. The mineral rich water also have power to cure several skin and eye diseases. The site also contains remains of ancient city Hierapolis. Grand prismatic spring is the largest hot spring in United States located in Yellowstone National Park of Wyoming. The hot spring obtained it’s name from striking colors. It feature vibrant blue water in the center surrounded by vivid colors including red, orange, yellow, blue and green. The colors around the hot spring is actually result from the action of band of cyanobacteria, can thrive in hot waters. But they are not present in the center pool due to extreme heat. The formation of color by cynobacteria also depend on temperature. 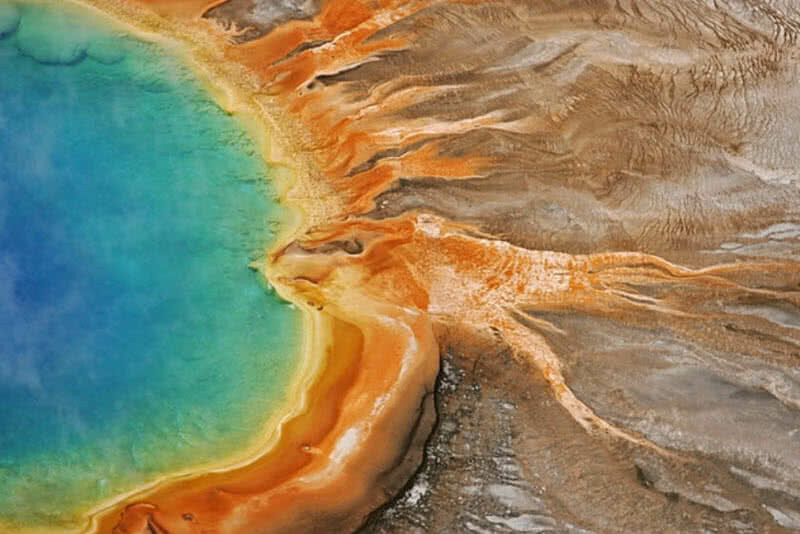 In summer season the colors around the grand prismatic spring found to be orange and red. In next winter season the color will changes to deep green. In case of thermal activity the hot spring discharges 2100 liters of water per minutes. The temperature of emerging thermal water ranges between 63.3 and 86.5 degree Celsius.